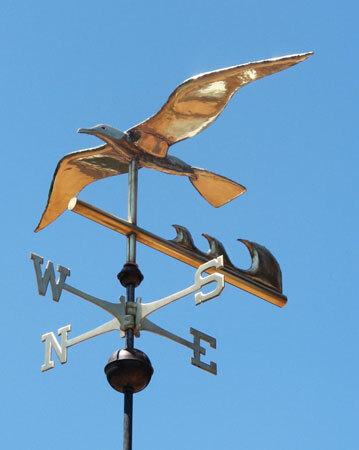 The Soaring Seagull Weather Vane shown here was crafted in copper and brass, with optional gold leafing on its beak and the crests of the waves. The customer who originally commissioned this design lived near Mexico City and wanted the bird to be sleek and stylized rather than naturalistic in appearance. The ‘waves’ act as the wind catcher on this design, causing the seagull to turn and face into the wind. 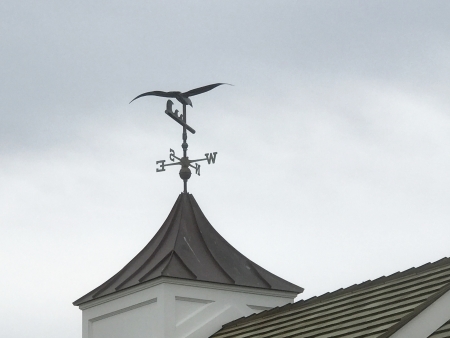 As with many of our birds with outstretched wings, this weathervane comes with a security device. Along with our airplane weathervanes which also have outstretched appendages, you can actually get upward pressure on the sculpture piece when winds are high. For this reason the seagull come standard with a security device that allows the sculpture piece to turn freely but helps prevent it from rising upwards in strong winds. This was definitely a consideration for a Soaring Seagull Weathervane we shipped to southern Ireland several years ago. The weathervane resides on a cottage at a bird sanctuary which is subject to frequent gale force winds. Because we build each weathervane to individual order, we were able to add some internal bracing to further reinforce it. Its sleek streamlined construction made is a good candidate for such a windy location. We have Seagull Weathervanes scattered up and down both the Atlantic Seaboard and the west coast of the United States, although we also have a couple in Utah as well. One person ordered this vane after reading Richard Bach’s story about Jonathan Livingston Seagull. Gulls—the larger species in particular—are resourceful, inquisitive and intelligent birds, demonstrating complex methods of communication and a highly developed social structure. Many species of gull have learned to coexist successfully with humans and have thrived in human habitats. Gulls are usually grey or white, often with black markings on the head or wings. The large species take up to four years to attain full adult plumage, but two years is typical for small gulls.